The Postnational Fantasy Essays on Postcolonialism, Cosmopolitics and Science Fiction, Now Published and Available from McFarland! UPDATE: The Postnational Fantasy now has its own page on dynamicsubspace.net here. 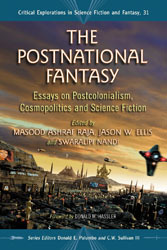 I am very pleased to announce the publication of The Postnational Fantasy: Essays on Postcolonialism, Cosmopolitics and Science Fiction, my first co-edited collection of essays with with my good friends and colleagues Masood Ashraf Raja and Swaralipi Nandi! Click here to purchase it directly from the publisher McFarland & Co or click here to purchase it from Amazon (they should receive copies soon). Below, I have included the book jacket copy, editor biographies, and the table of contents. Masood Ashraf Raja is an assistant professor of Postcolonial literature and theory at the University of North Texas, and editor of Pakistaniaat: A Journal of Pakistan Studies. Jason W. Ellis is an English literature Ph.D candidate at Kent State University and holder of an M.A. in science fiction studies from the University of Liverpool. Swaralipi Nandi is an English literature Ph.D candidate at Kent State University, whose research focus is postcolonial literature and theory. Also read the announcement on Masood Raja’s blog here. Thanks, Masood, and congratulations to all of us on finally seeing our collection published! And many thanks to our contributors without whose work we would not have had such a great collection of essays! Jason: Sorry I spelled “Congratulations” wrong:)) Please fix it if you can. And yes, many thanks to all our contributors who shared their work with us. I must also point out publicly that you put most of the work in this project and both Swaralipi and I are grateful for that.